Yellow. The colour that I long refused to wear. I claimed that since it matched with my hair, I couldn’t pull it off because I would be “all one colour”. Somehow, when I started covering my hair, I neglected to realize that since my hair colour would no longer be showing, this logic no longer applied. Since covering my hair, I had always avoided yellow scarves and ran towards my favourite blues and greens. Well, of course this logic was flawed, because my own “yellow” hair was no longer showing! Therefore I would not be all one colour if I wore it. Thanks to my mistakenly holding this scarf up to my face in a store (I was reaching for the blue), I have realized that yellows and golds are probably some the most beautiful colours for me to wrap over my hair! I especially like this scarf because it is so big and soft… quite comfortable! And of course, my “tichel tiara” made it look even more elegant. I think this is one of my new favourites! ← Beginner’s Guide and Shopping Advice! Beautiful! I love the little touch of sparkle from your ‘tiara’, too. What a happy accident! 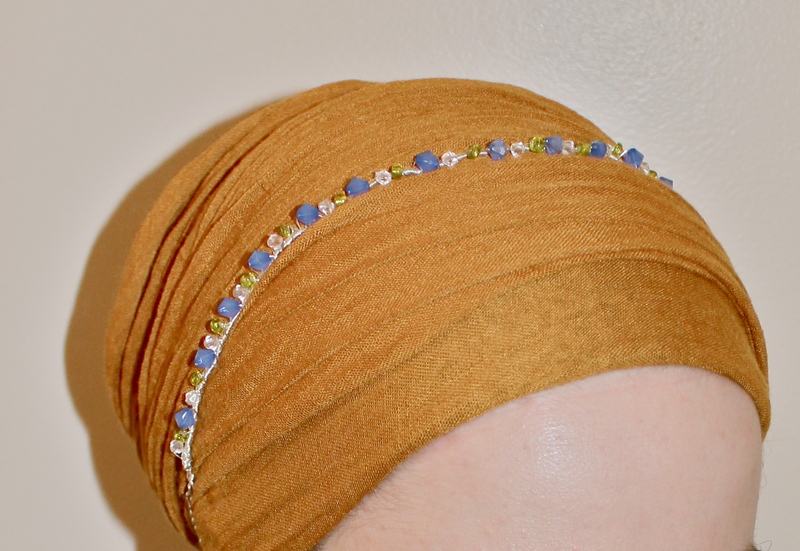 would love to see you with a shiny gold tichel!! Your hair is also no longer “yellow”, because it never sees the sun. Beautiful! I want a tiara like that, too! I really like this color on you also. Obviously some shades of any color may not look well on a person based upon their skin tone, however this particular color is very flattering. The tiara is wonderful also. I think we should see if Batsheva will go back into business. So beautiful! I love the tiara too. Where do you buy the decorations for the tichels? A woman on this site (Batsheva) made this one for me! I adore so many of your wraps but I have to say, the look of just one solid color is amazing on you. I love this one. True words! I sometimes forget how wonderful one solid colour can look. I have a question if you don’t mind. You can answer here or in another post. How do you keep your skin where the wraps touch from breaking out (especially in the summer)? I know when I wear a headband for running it rubs and makes my skin irritated. Do you find wraps make your skin more or less sensitive (where it touches)? I will answer this briefly here but you’re right, I should make a post about it. I wear the velvet headband underneath all of my wraps. I actually wear it not too far forward (probably about a centimeter of hair showing in the front). Then, I wrap my scarves over the headband, overlapping it so it covers all of my hair. Because of the velvet headband, I don’t have to tie my scarves too tight, and because the headband is over my hair, it doesn’t cause breakouts. Also, make sure your scarves are made of a breathable material. I hope this helps! Let me know how it goes and we can try to figure out a better solution if need be.